They'll be cruising around the house in no time thanks to this touchscreen-equipped chair. As any parent of a small child knows, toddlers want to explore. They want to look and touch (and sometimes even taste) everything. It's how they learn about the world. Unfortunately, kids with certain physical disabilities can't move about as easily. This difficulty can create a bit of a cognitive gap between them and other kids their age. The Tot Bot is a chair designed to give these children the increased mobility they need to investigate their surroundings thoroughly. 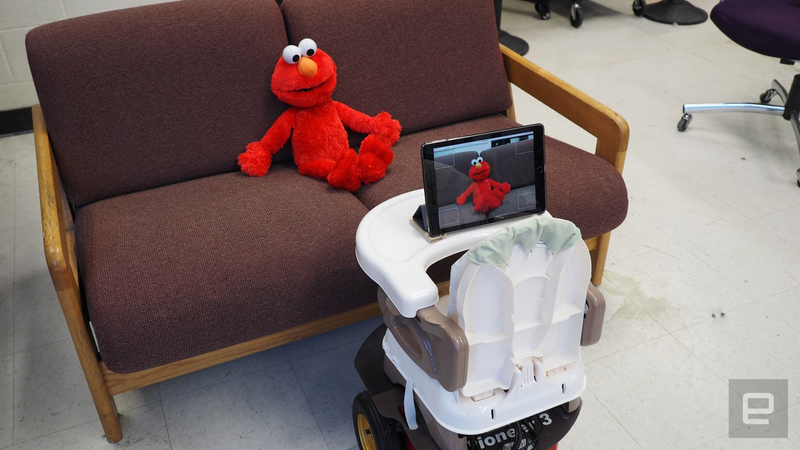 The Tot Bot is the project of NYU Tandon School of Engineering students Tanaya Bhave and Gang Haiming, who grew concerned after reading studies that indicate disabled children may have developmental problems due to this inability to explore. Unlike larger systemic issues like socioeconomic class that can cause cognitive delays, mobility is something we can fix with technology. After all, we already have wheelchairs. But most existing chairs are controlled using a joystick in one of the arm rests -- simple enough for an adult, but surprisingly difficult for a small child to maneuver. And it's even harder for a child with a disease like cerebral palsy. The solution was to replace the joystick with a touchscreen. Plenty of kids these days are familiar with how it works. In fact, they seem to expect it. Small children are usually excited to get their hands on a parent's phone or tablet to watch videos or play games, and I've seen some kids actually get mad when they tap a non-touch display and nothing happens. The Tot Bot system is incredibly intuitive: A parent installs the app on any mobile device, which is attached to the chair. The phone or tablet then uses its camera to display a video of whatever's in front of the child, who simply taps on the image of whatever they want to examine. The chair will then move toward that object, using a combination of cameras and a sonic rangefinder in its base to calculate the distance needed to travel while also avoiding collisions. The chair then stops just shy of the object, turning to the side so the kid can reach out to touch and even grab it. 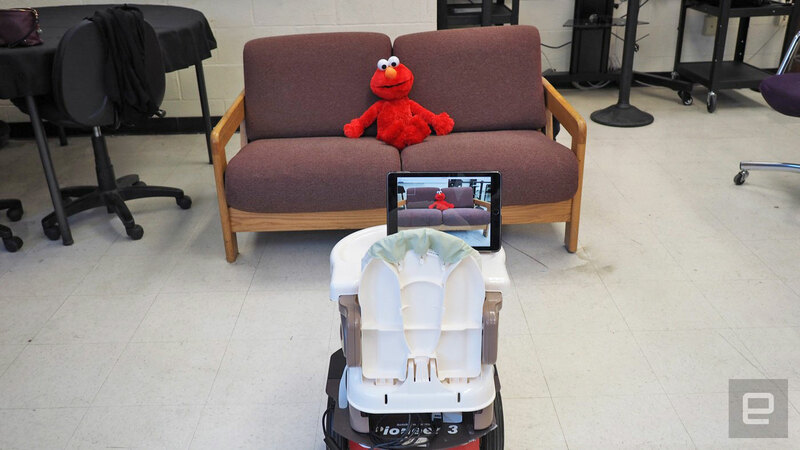 For demonstration purposes, Bhave and Haiming used a bright red Elmo doll, but the system can target anything in the room the cameras can see. Safety was definitely on Bhave and Haiming's minds when designing the Tot Bot -- after all, increased mobility means increased opportunities for kids to get into trouble. So the system works with RFID tags, allowing parents to place tags on objects and areas they deem "safe." This will restrict the chair's movement toward those points only -- no baby gates or extensive childproofing needed. The Tot Bot is still in its earliest stages of development, so it'll be a while before we see it in the wild, if ever. But if you want to check it out -- and have a small child who'd like to give it a test ride -- the chair will be on display this Friday at NYU Tandon's Research Expo, open to the public from 1-4 PM at Metrotech Center in Brooklyn.